The Gower in spring is beautiful indeed. If you visit Caswell Bay and walk up through the woodland behind the main car park you will soon enjoy the smell of garlic pushing its way between the delicate anemones. On the coast, the vibrant yellow of gorse enhances the delightful view across Three Cliffs Bay. 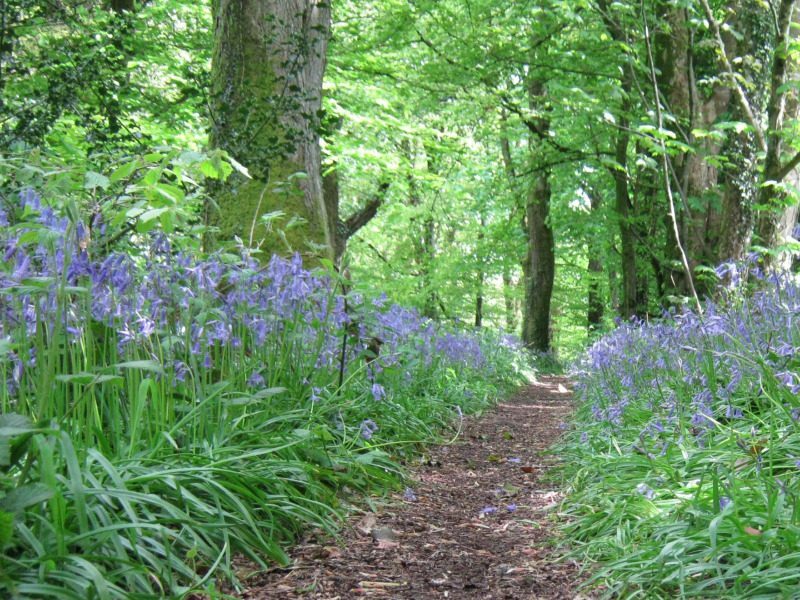 For bluebell lovers there is this bluebell walk through Clyne woods, Swansea Bay offering thick carpets of bluebells set beneath the awakening beech trees which provide a lovely, dappled shade on a sunny afternoon. 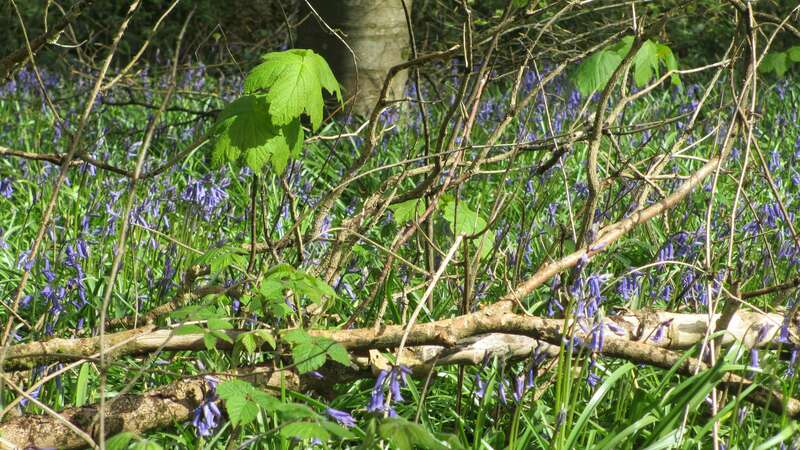 Our bluebell walk starts at a small car park at the top of Mill Lane, which means you can easily combine it with a visit to Clyne Gardens if you wish. Travel from Swansea towards the Mumbles on the coast road and take the entrance to Mill Lane at Blackpill (opposite the lido and just before the entrance for the Woodman Pub). Parking for the walk is towards the top of Mill Lane, on the right hand side, opposite the entrance to Clyne Castle, which used to be a student hall of residence, and has now been converted to luxury flats. From the car park, take the unmade, gated road on the left which climbs gently through the woods. You will quickly come across an overgrown folly on the left of the track, which you can explore if you wish. After about half a mile, you need to take a clear left hand fork onto a smaller track (you will see bluebells to your left up the hill). Follow this track round to the left as it climbs and you will find yourself walking in a loop and back along the top of the hill. The best bluebells are along this ridge walk and when combined with the new foliage on the beech trees they always take my breath away. Take time to enjoy, and maybe take a few photos! Towards the end of the ridge there is a steep drop on the left of the path (just be aware with small children, ours always negotiated it without any trouble). The path to the left here is now an off road cycle track so you need to continue towards and through the bracken, where the path joins a larger footpath at right angles to it. Follow this path downhill and it will take you back to the car park entrance. The bluebell walk described takes about half an hour and the other tracks from the parking area are also well worth exploring. They offer good views across Swansea Bay and access to Swansea Cycle Path which passes through Clyne Valley Country Park. As mentioned there are also a number of off road cycle tracks around woods if you wish to bring your bike. To extend your stay further and view some spring flowers in a more formal setting you can cross Mill Lane from the car park, and head to the iron gate about 50 yards down the road. This will take you into Clyne Gardens, a must for garden lovers in the spring, with plenty of bluebells in the wilder areas here as well. Walk down the main path through the gardens and you will be able to visit the Woodman Pub for a meal or a drink. You have reached the seafront here and can even head on round to the Mumbles or back to Swansea Marina if you would like a longer excursion. When we lived in Swansea we looked forward to our bluebell walk each year, and whenever possible we still complete it even though we live away. If you are in the area at the right time, why not try it and let us know what you think. Alternatively, tell us where you get your bluebell fix each year! Accommodation suggestion: Do you need somewhere to stay whilst you enjoy the Gower and Swansea Bay? Our self-catering property sleeps up to 8 people in comfort and is dog friendly. Check us out at www.gower-self-catering.co.uk and maybe we will see you soon. 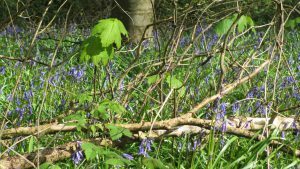 This entry was posted in Gower Walks and tagged bluebells, circular walk, Clyne Gardens, clyne valley country park, Clyne Woods, Swansea Bay, walking.